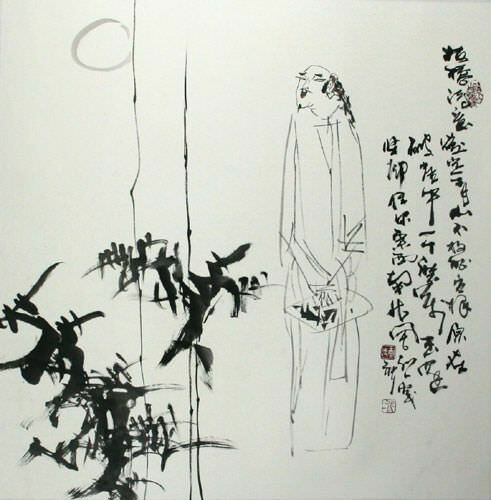 Artwork Panel: 67.5cm x 68.6cm ≈ 26½" x 27"
Silk/Brocade Border: 77.5cm x 78.6cm ≈ 30½" x 31"
This painting features the artist, calligrapher, and poet named Zheng Ban-Qiao (His real name is Zheng Xie). He lived during the Qing Dynasty between 1693-1765. He was kind of an outsider, and many thought his ways were strange. He was both praised and criticized for his work. Often praised for his calligraphy style, but run out of his government post for daring to have a shelter built for the poor people of the kingdom. He is a person who went against the current, did his own thing, remembered to enjoy life, and brought about ideas for social reform. Some have branded Zheng Ban-Qiao as a lunatic or madman, but if a madman is one who is benevolent to the poor, and creates revolutionary artwork, I want to be a madman too. The title of this painting is simply "Ban Qiao Shi Yi" which means "Ban-Qiao (having a) Poetic Feeling". I suppose you could call this the state of mind you are in when you feel like writing poetry. It's kind of a romantic state for some. Also indicated in the Chinese characters is the fact that this was painted in 2006 as well as the artist's signature. The artist's name is (Li Shui-Yi) who lives in the Sichuan Province of Southern China. He specializes in a style of traditional artwork that has an abstract essence. His paintings are signed with just his given name of . You may be able to read his red chop which also contains the same characters of his given name but written in this ancient seal script form of Chinese.